Chart the route that Lewis, Clark and their crew took on their great journey to the Pacific Ocean! The United States looked a bit different back then. Can you name the present-day states that they traveled through? 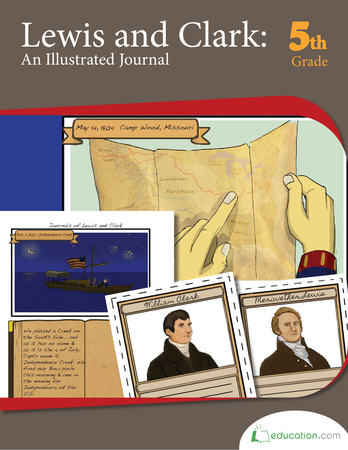 Check out this Lewis and Clark expedition map that shows the route's landmarks then and now. Read about a few of the Native American tribes that Lewis and Clark encountered on their journey west. If your child thinks camping in an RV is "roughing it", just wait until he hears what Lewis and Clark went through! Who were Lewis and Clark before they became a famous expedition team? Read a bit about Clark's life before and after the great journey west. This workbook challenges kids to flex their spelling and grammar skills while reading about the trip in the words of the men. Lewis and the authors who inspired his fantastical stories! Students can create a collage passage to strengthen writing. Give him a fun challenge with this map of China, where he'll need to label each city on the map!